Fine Art by Rusudana Glonti: The story behind "Escape from Seafood Risotto"
The story of this painting started about 2 years ago. 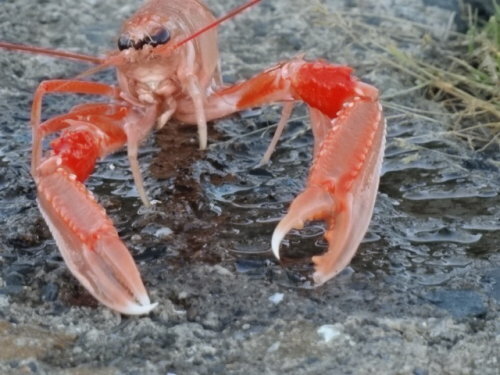 I had a weird dream about eating a seafood risotto, and all of a sudden it all started moving and the sea creatures started crawling out of the pot and off my plate. I woke up with a start and decided there and then that I need to turn that dream or at least the idea of it into a painting. Then I was distracted by other projects, but that dream kept haunting me and finally I got to the point when I started looking for live sea creatures - which turned out to be quite a task despite the fact that I live right near the coast of The North Sea. 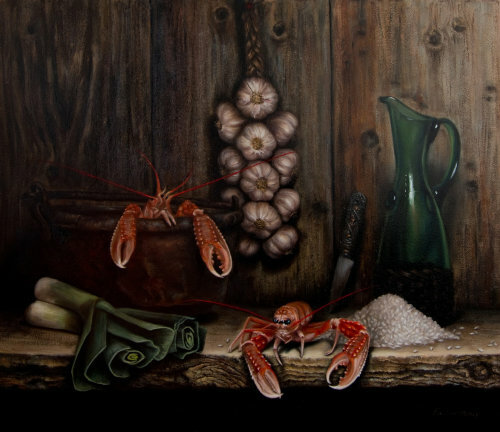 However eventually I decided that finding and putting lots of different sea creatures into the painting might be difficult and also confusing for the viewer therefore I decided to limit myself to langoustines as they were the largest and had the most peculiar colouring of all. 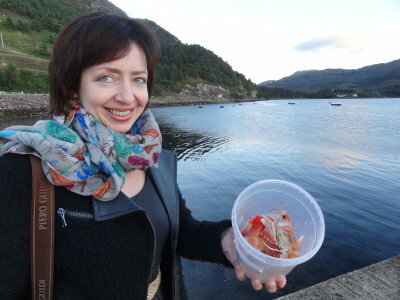 Now, the trick was to find live langoustines and I kept calling around the local fisheries who never seemed to have any. Frustrated, I went on to do another project and it wasn't until my husband and I went to The West Coast of Scotland for a long weekend that I finally got my wish. Even there it seemed like all the langoustines caught by fishermen were immediately delivered to the restaurants to be turned into delicious dishes and it took us a few days of calling around before we finally struck gold and one of the local restaurants promised to keep a few live langoustines for me. I was very excited to finally get the opportunity to work on the project that I had been thinking about. Of course, the langoustines cannot be expected to stay alive and pose forever so I had to make a couple of sketches right there on the the sea coast and also took a few reference photos after which the langoustines were solemnly released into the sea waters where they would have probably been caught the following day by the same fishermen. For the actual painting, I was using the frozen langoustines which of course inevitably defrosted in the process of painting and had to be replaced by the fresh ones, but it was important for me to see the live langoustines "in action" in order to depict them in motion rather then still. So the painting in question is stricly speaking not a still life because the subjects are supposed to be alive!